Born in 1901, printer, artist and engraver, Henry Winkles, sailed to Australia on the Mobile in 1852, and was on the Ballarat goldfields in late 1852 to visit his son, who had recently moved into the area with his family. 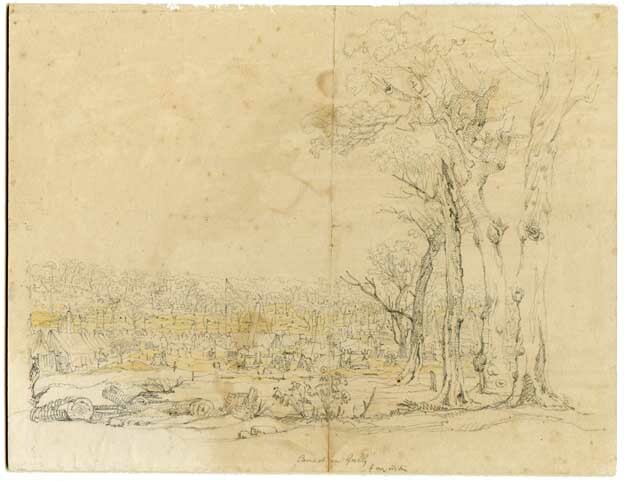 During Henry Winkles’ time in the region he sketched the landscape between Ballarat and Buninyong, documenting the material existence of diggers in the early years of the gold rush. His fascination with the rough and contorted eucalypts of the region is also a recurrent theme. Having trained as a draughtsman in England and Germany before journeying to Australia, Winkles parallels Eugene von Guerard, who was also at Ballarat in 1853. The work of these two contemporaries provides an interesting historical counterbalance. If Von Guérard's interpretations of Ballarat are stunning in their scope and their magnitude, Winkles’ sketches are equally so in their ability to capture the minute and the intimate. Henry Winkles died in 1860. 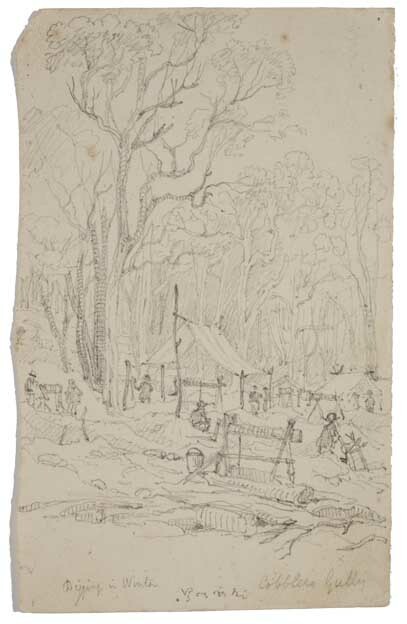 Henry Winkles, Digging in winter, Cobblers Gully, 1850s, pencil on paper. Together with Karl Ludwig Frommel, Winkles founded the first studio for steel engraving in Germany. ↑ Index to Unassisted Inward Passenger Lists to Victoria 1852-1923, http://prov.vic.gov.au,accessed 20 December 2013. 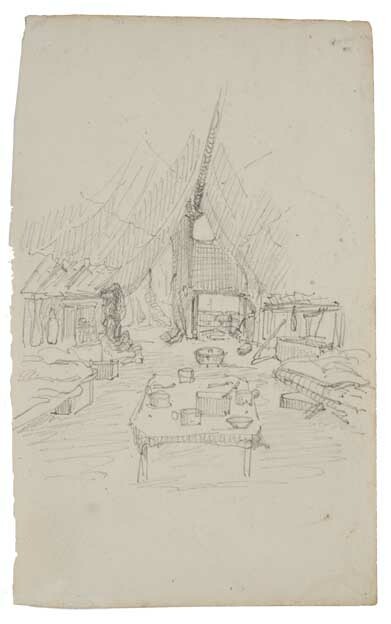 Henry Winkles, Canadian Gully, 1850s, watercolour, pencil on paper. This page was last edited on 19 December 2013, at 23:00.